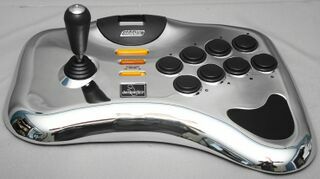 The Alloy Arcade Stick is a third-party arcade stick for the Sega Dreamcast created by Recoton and distributed under their InterAct label. As the name suggests, it has a highly reflective metallic finish. It is also a programmable controller. InterAct were once set to release this stick in a white matte finish, but these plans never materialised.